Few fossils are more dramatic than the long-extinct eurypterids. 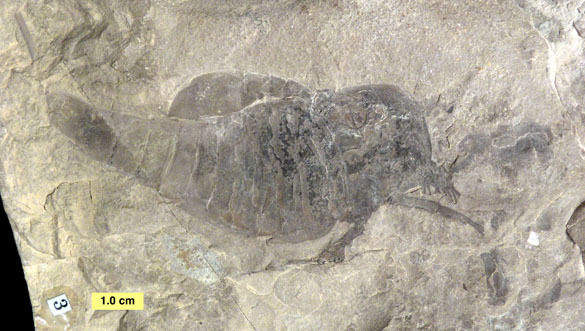 Above is one of Wooster’s best fossils: Eurypterus remipes De Kay 1825 from the Bertie Waterlime (Upper Silurian) of New York. (Thanks to Roy Plotnick for help with the identification.) As far as eurypterid fossils go, it is average (see Samuel J. Ciurca’s wonderful eurypterid pages for superb specimens), but for our little teaching collection it is a gem. 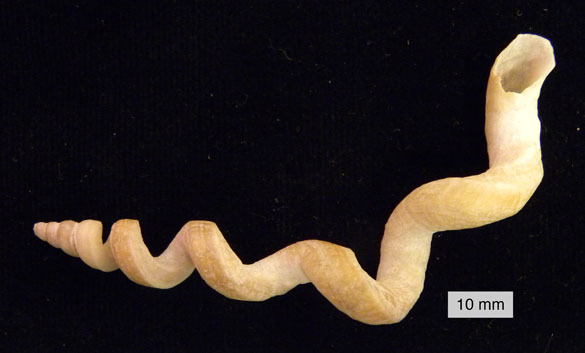 Note that some of the fine details on the appendages are preserved. Here’s looking at you: a eurypterid head showing the pair of compound eyes. 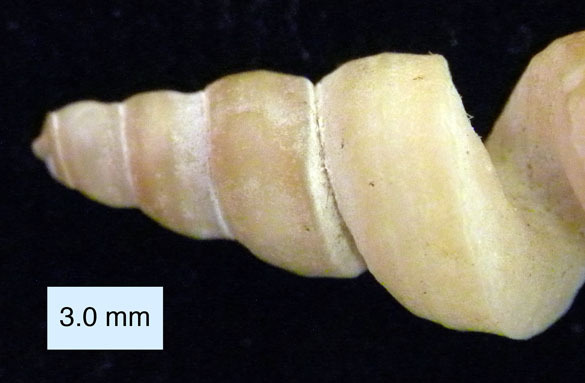 The anterior margin “lip” indicates that this is a “carcass” specimen and not a molt fragment. Eurypterids are commonly called the “sea scorpions” because of their long segmented body (opisthosoma), fused head segments (prosoma), sharp tail piece (telson) and claws (chelicerae). 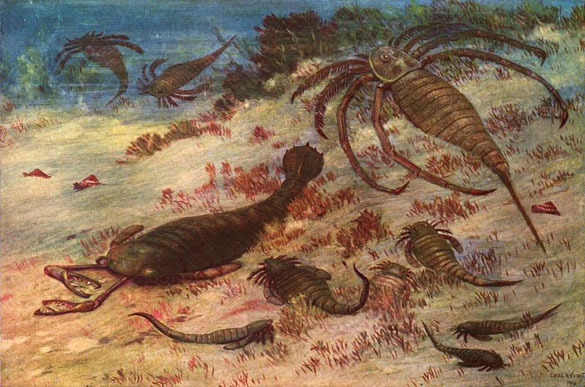 The scorpions and eurypterids, in fact, likely share a similar common ancestor. It should be no surprise to learn that eurypterids were swimming predators. The name comes from the Greek eury- for “broad” and -pteron for “wing”, referring to the large swimming appendages. Most eurypterids were relatively small like our specimen above, but some were almost two meters in length. 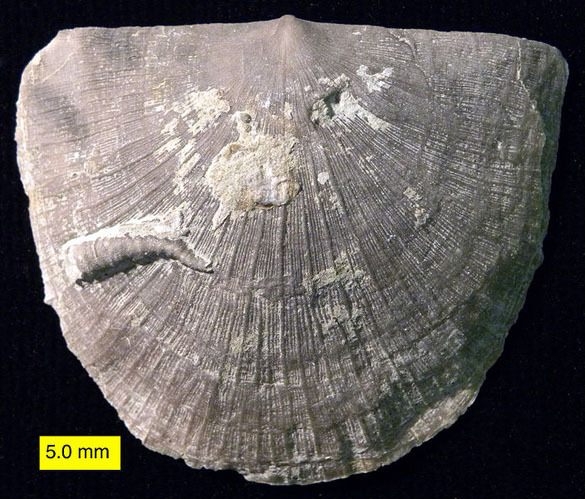 They lived from the Ordovician to the end of the Permian Period. 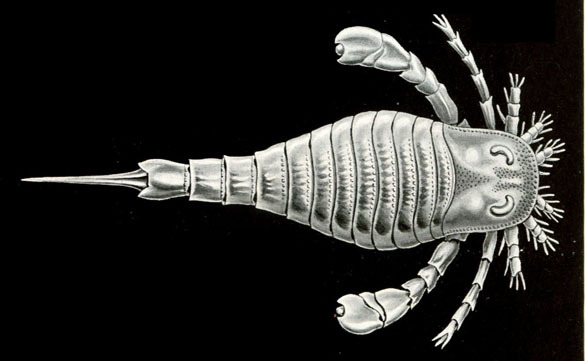 Eurypterid reconstruction in Clarke and Ruedemann (1912). The artist is the famous paleontological illustrator Charles R. Knight. 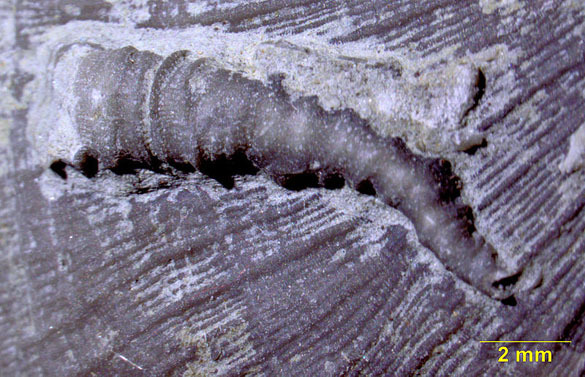 Eurypterus remipes was the first eurypterid fossil formally described. 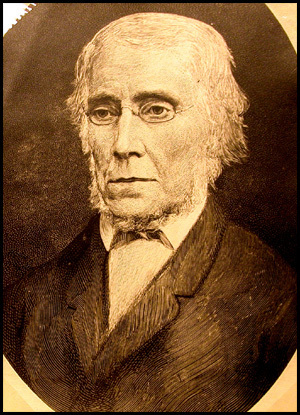 The American zoologist James Ellsworth De Kay (1792-1851) did the honors while working in upstate New York. De Kay was orphaned at a young age but still managed to attend Yale (but no degree) and then complete an MD at the University of Edinburgh. He was not excited by medicine (one time he said it was “repugnant” to him), so he found himself doing many other things, such as traveling through Turkey (about which he wrote a book) and negotiating ship building contracts with emerging South American countries. Eventually he landed a job with the new Geological Survey of New York, publishing a multi-volume set called Zoology of New York State. Back then the boundaries between the natural sciences were less strict. Eurypterus fischeri (Eichwald) from the 47th plate of Ernst Haeckel’s Kunstformen der Natur (1904). De Kay’s Eurypterus remipes was so charismatic that it became the state fossil of New York (although it took them until 1984 to declare it), and it was a global sensation in the mid-nineteenth century. 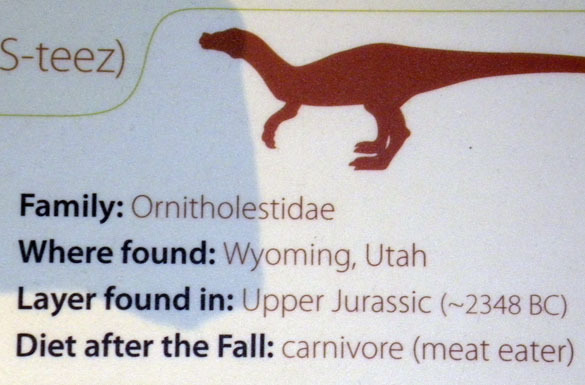 Our little specimen is certainly one of Wooster’s paleontological treasures. Clarke, J.M. 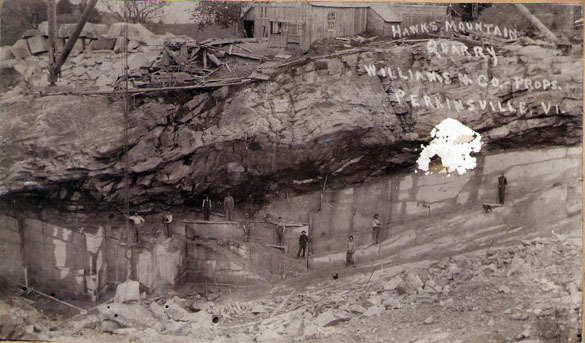 and Ruedemann, R. 1912. The Eurypterida of New York. Volume 1. 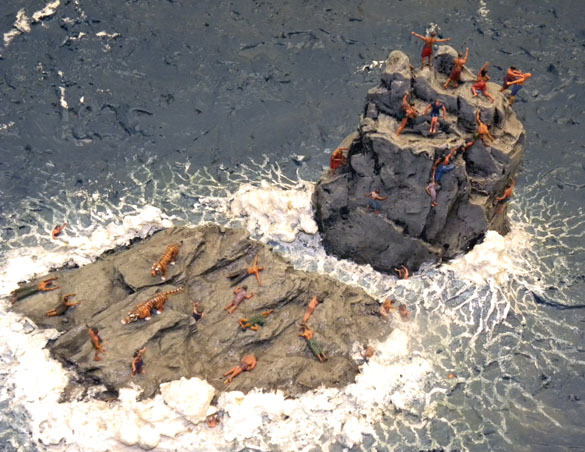 New York State Museum Memoir 14. 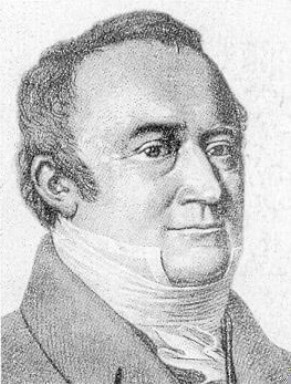 De Kay, J.E. 1825. 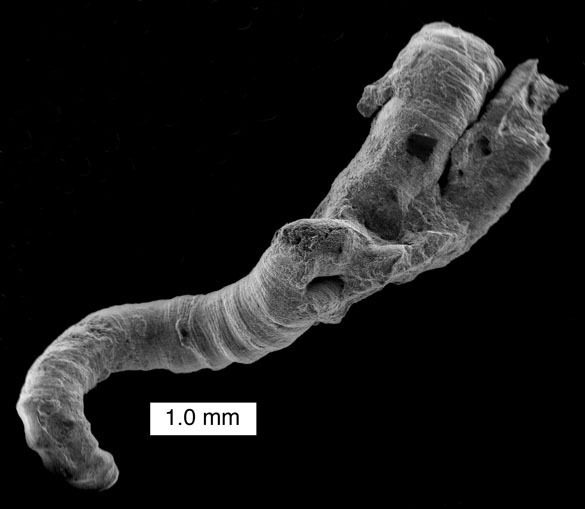 Observations on a Fossil Crustaceous Animal of the Order Branchiopoda. Annals of the Lyceum of Natural History of New York, i, 1825, p. 375, pl. 29. Kjellesvig-Waering, E.N. 1963. 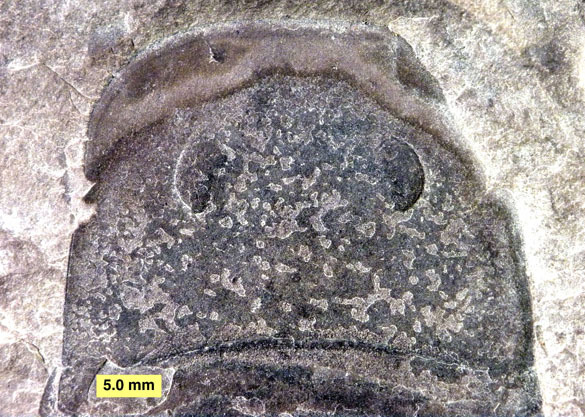 Note on Carcinosomatidae (Eurypterida) in the Silurian Bertie Formation of New York. Journal of Paleontology 37: 495-496. Tetlie, O.E. 2006. 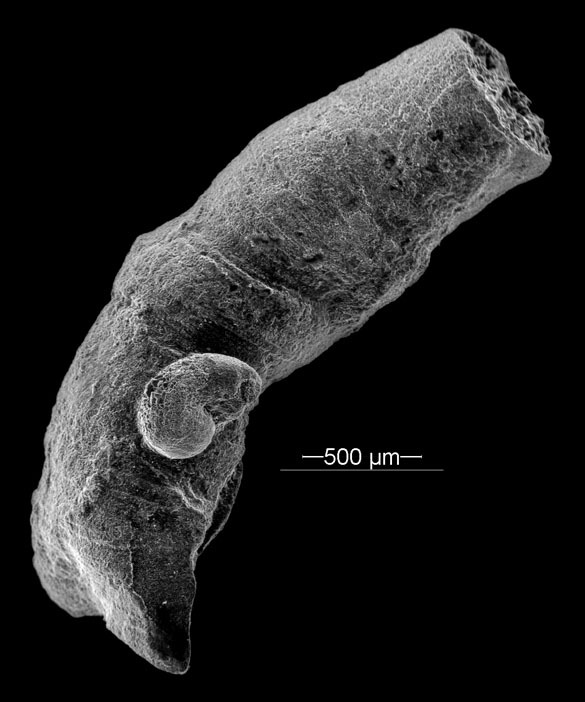 Two new Silurian species of Eurypterus (Chelicerata: Eurypterida) from Norway and Canada and the phylogeny of the genus. 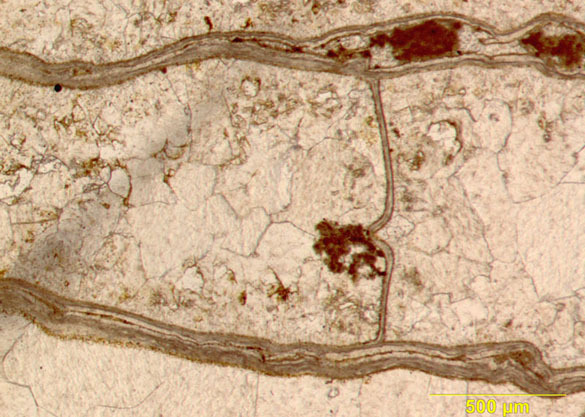 Journal of Systematic Palaeontology 4: 397-412. This past Saturday Elizabeth Schiltz of the Philosophy Department and I took our First-Year Seminar students on a long drive to the infamous Creation Museum in Petersburg, Kentucky. It was a beautiful day and we had a good time, if you set aside the intellectual travesties and pseudoscientific contradictions of the place. Our Wooster students were very polite and inquisitive, and they had many observations after we left the premises. The museum is uber-slick and the staff extremely helpful and friendly. 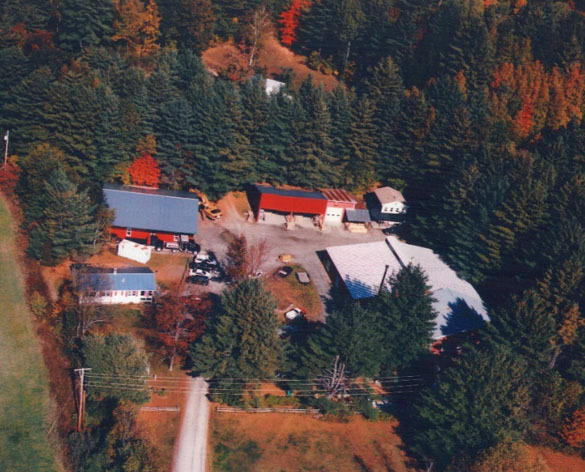 We were on their property and grateful that they are willing to share their story and facilities with anyone who pays admission and follows the rules. Still, we felt both astonished and oppressed by the place. The scene above is just inside the entrance of the museum. The juxtaposition of an animatronic dinosaur and a happy child tell us much about the philosophy and science of the organization: this is not a museum in the traditional sense. Dinosaurs with people is one thing — the dinosaur not eating the child is another! Elizabeth’s First-Year Seminar section is titled “On the Meaning of Life“. Her students have been working through worldviews and why people hold them, so this trip was most appropriate. My First-Year Seminar is on “Nonsense and Why it is so Popular“. It is obvious why we were here! 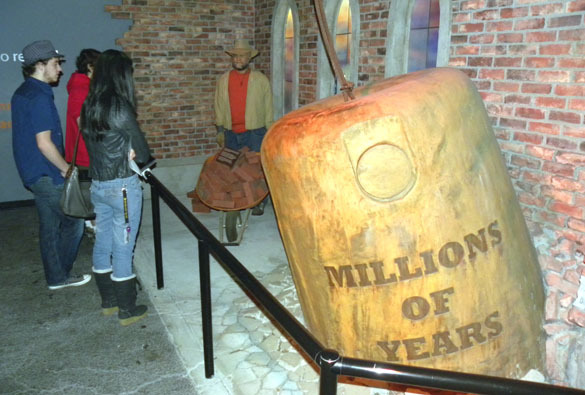 The Creation Museum has been reviewed many times by scientists and other skeptics. (Here is a detailed account of a visit.) I am just presenting our impressions here with a few photographs. 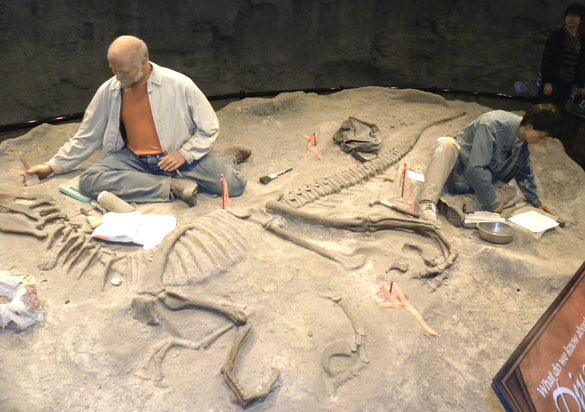 One of the first displays in the Creation Museum is this life-sized diorama of two paleontologists excavating a dinosaur skeleton. 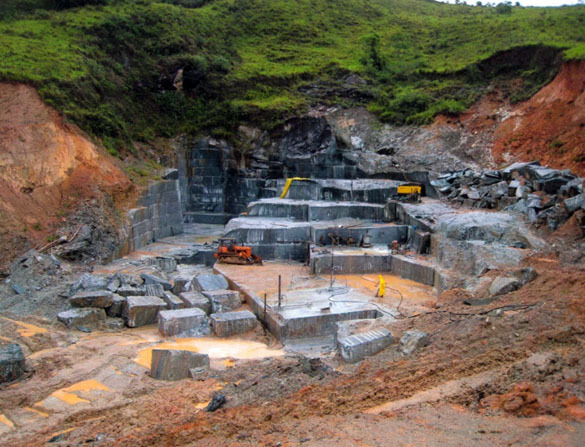 (Geologists should note how important they are to the creationist worldview.) The scientist on the right is a traditional evolutionist; the older man on the left is a heroic scientific creationist we meet several times later in displays and videos. Both are looking “at the same facts”, but they have different “perspectives” and reach wildly different conclusions. From the start we saw a surprisingly post-modern view of science — it is all in the presuppositions of the observer with the “facts” as just a text for subjective analysis. Especially to a geologist, the time scale of creationists is bizarre. 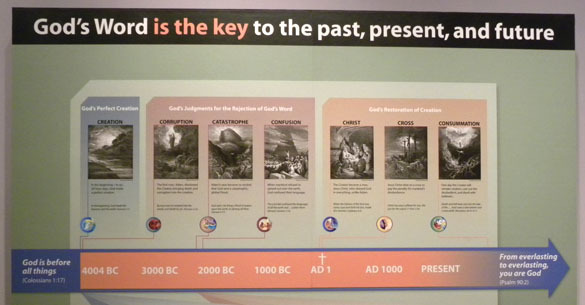 At the Creation Museum the old Archbishop Ussher chronology is used, giving the first year of the Universe as 4004 BC. Here you see the timeline combined with the “7 C’s of History“. A literal reading of Genesis (and the rest of the Bible) is essential to the Young Earth Creationist view of Christian salvation. 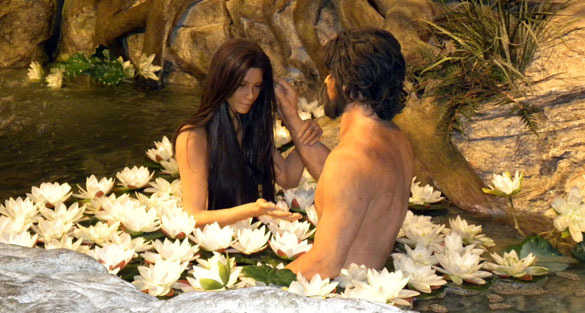 We all agreed that the models for Adam and Eve were … well … hot. They were so well done that, in this case especially, we felt like we were intruding on intimate moments. Just above this happy pair, out of view, the snake awaits with his temptation. After their disobedience to God and their Fall, Eve and Adam look far less babelicious. Here they are making a bloody sacrifice for their Original Sin. Lots more blood and angst follows. 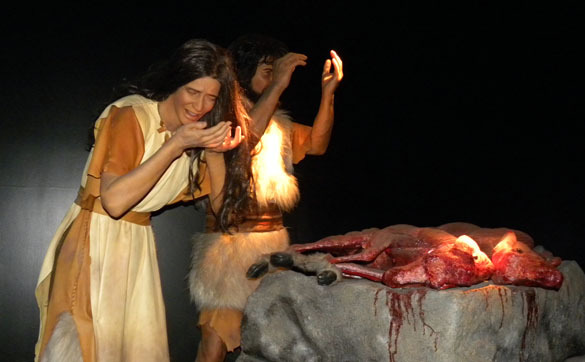 The Flood of Noah gets a lot of attention, of course, at the Creation Museum. 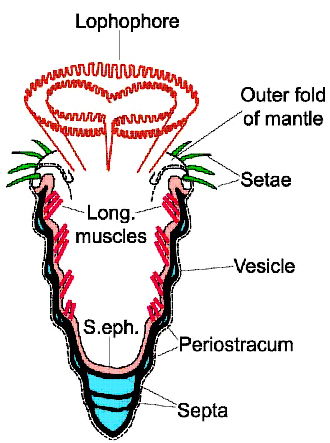 Among many other things, it is used to explain the fossil record and the current distribution of life. I suspect the museum designers also derive a bit of pleasure from the idea of sinners dying in misery and despair as a small remnant of the righteous survives. A critical part of the message in this museum is that the “evolutionary worldview” has brought much pain and destruction to our civilization. This elaborate and rather odd display shows the concept of “millions of years” destroying a church building. (Just think what billions of years would do!) Again, note the threat of modern geology to the fabric of God-fearing society. 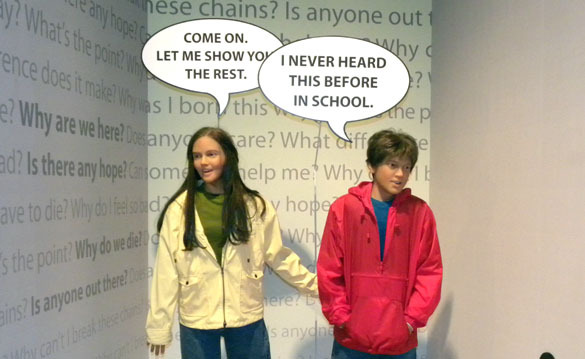 Most disturbing is the effect of an institution like the Creation Museum on the education of children. This display makes sure you get the point that kids are at last hearing the real story outside of their corrupting public schools. The museum caters to home-schooled children for their “science” components, as well as to many private Christian schools. We often overheard parents and teachers telling their students “what we believe”. I caught a couple conversations describing a fallacious view of evolution (using the classic “I don’t know why there are still monkeys if we evolved from them” argument) that will likely go unchallenged in that child’s life. Very sad. At the end of our experience we visited the outdoor portion of the museum with beautiful gardens and, to our delight, a petting zoo! This was the best way to discharge the tension built up during our visit: playing with innocent goats, feeding llamas, and watching albino peacocks display. All products of a long evolutionary history despite whatever stories we tell. Last week I had the marvelous opportunity to visit two very different museums with Wooster Geologists. 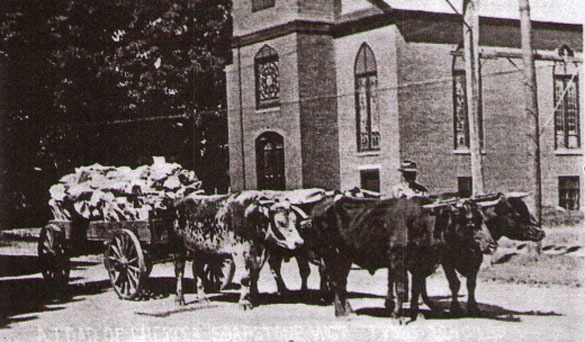 This is the first of two posts with short vignettes of the memorable sights and sounds. The first museum was the Cleveland Museum of Natural History. Greg Wiles and his Climate Change class invited me to accompany them to see the visiting climate change exhibit. 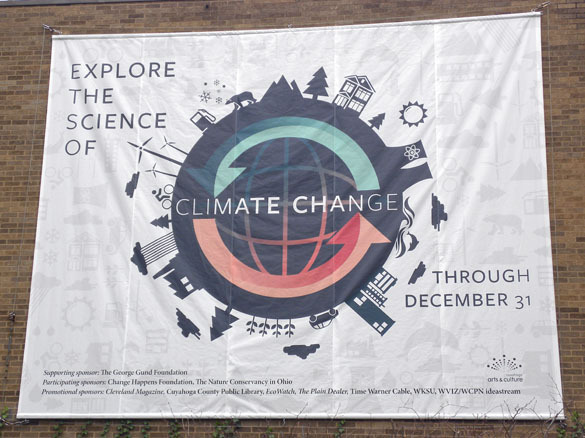 It was an excellent display of the latest ideas about changing climates, including accurate accounts of the evidence, controversies and possible solutions to the problem of anthropogenic global warming and its associated troubles. It was a pleasure to see this presentation with Greg because of his deep and very current knowledge of the science and politics. 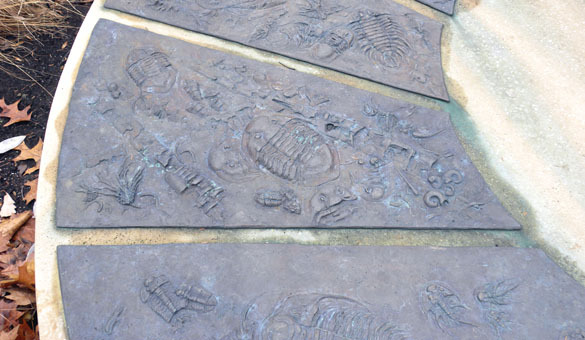 The large sundial above represents the history of life by geological periods. Note the beautiful ammonite fossil model as part of the gnomon (the portion that casts the shadow). 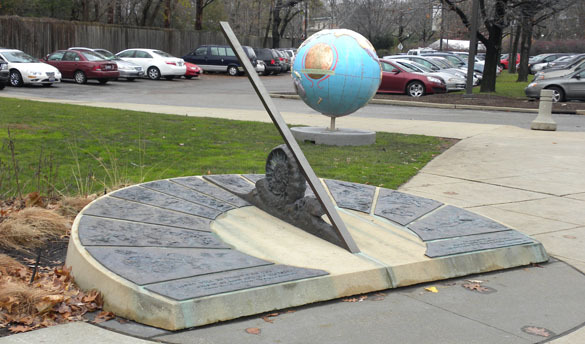 Each segment of the horizontal portion of the sundial is a geological period. Can you tell which periods are shown here? Finally, I think this sculpture in the front garden entitled “Venus From The Ice Field” by Charles Herndon is ingenious. 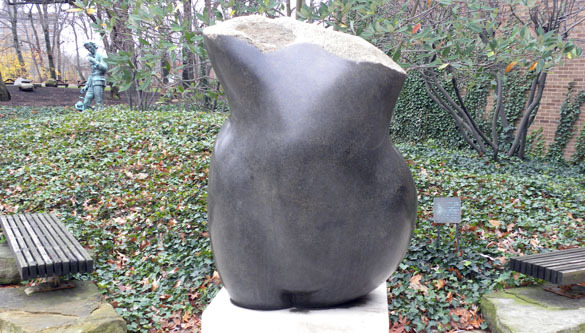 It is carved from a granite boulder found in the local glacial till. My next post will be about the second museum — a very different place!